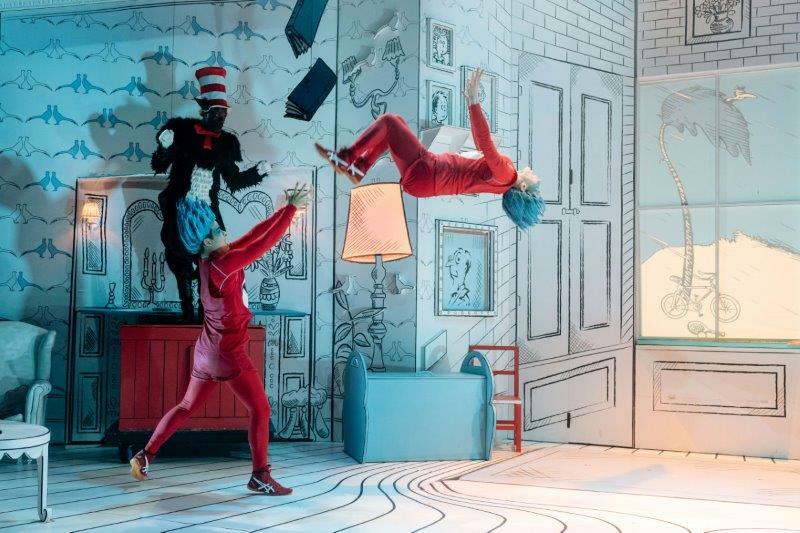 Staging a play for children is no easy feat, even if the cast and creatives of The Cat in the Hat, co-produced by Leicester Curve and Rose Theatre Kingston, make it seem that way. The young audience are fickle to say the least, “shall we pretend I’m invisible?” shouts ‘The Boy’ in an attempt to deceive his sister, which is met with screams of conspiratory allegiance from the very same audience who snitch on him moments later. 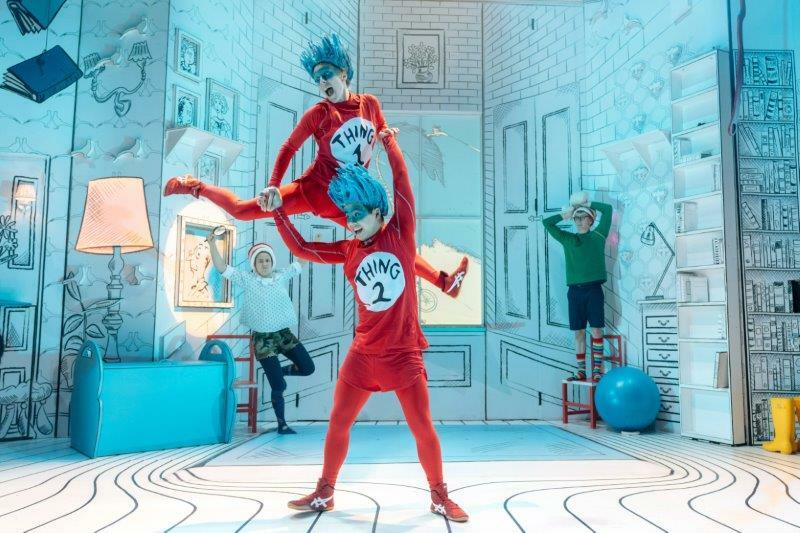 Dr. Seuss’s famous picture book, has been brought to the stage before, but this production finds a way to do it a little differently. Original music from Tasha Taylor Johnson complements rather than distracts from the well-known rhyming prose, while the inclusion of acrobatics from circus choreographer Jack Horner ensures mayhem reigns supreme. Suba Das directs this production, which treats its audience as equals. The cast often dash off the stage, running around the auditorium in a frenzy of chaos and confusion, much to the delight of the children, and many of the adults too. Isla Shaw’s sketchbook design set plays homage to the original Seuss book, but hides a number of surprises beneath the outlined backdrop. 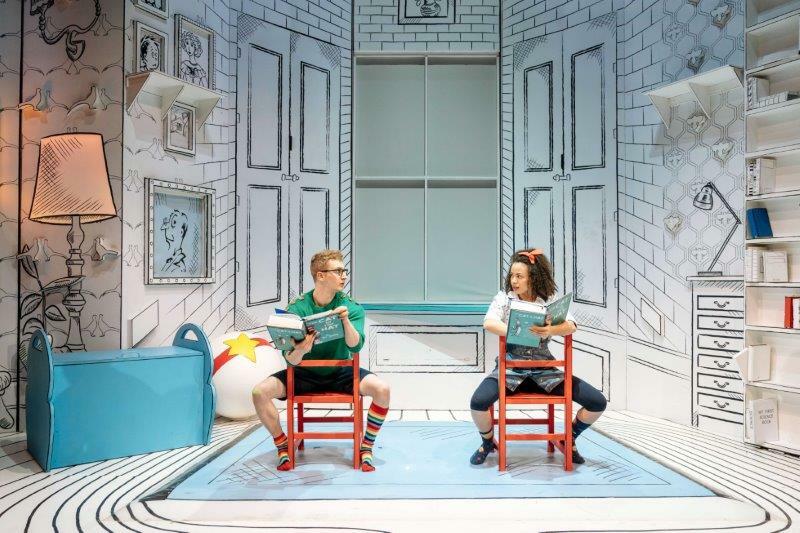 Melissa Lowe as Sally, and Sam Angell as her brother, simply named ‘The Boy’, display unending energy as they bounce around the stage, in playful glee with their feline visitor. They do a really incredible job of capturing the attention of their young audience, Angell in particular very quickly develops a kind of friendship with the children in the room, they feel like part of the story that Angell is telling, and they relish in it. 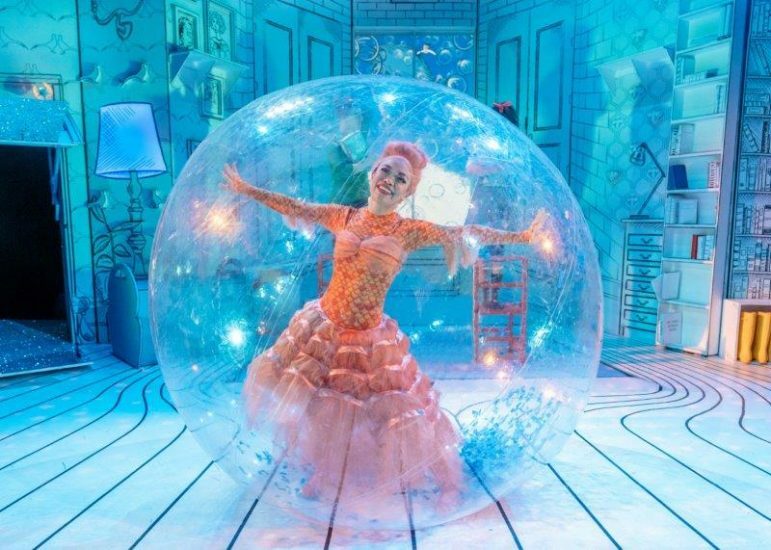 Charley Magalit as the fearful Fish spends much of her time in a giant goldfish bowl, or on top of the stage in a precariously placed pot, but that doesn’t stop her delivering some fabulous vocals, even if they are slightly muffled by her bubble like confinement. Of course, we’ve all come to see the Cat and his oversized hat. When Nana Amoo-Gottfried (in a stunning costume) isn’t balancing on a large rubber ball, with all manner of objects hanging from his paws and tail, he’s strutting round the stage with that mischievous swagger that makes the pandemonium he creates all the more enjoyable. Much of this anarchy comes from Thing One and Thing Two, played by acrobats Celia Francis and Robert Penny, circus their skills drawing gasps from the youngsters who have become part of the game. At times the sound effects and music overpower the voices coming from the stage, but with a room full of delighted children, it’s not much of an issue. 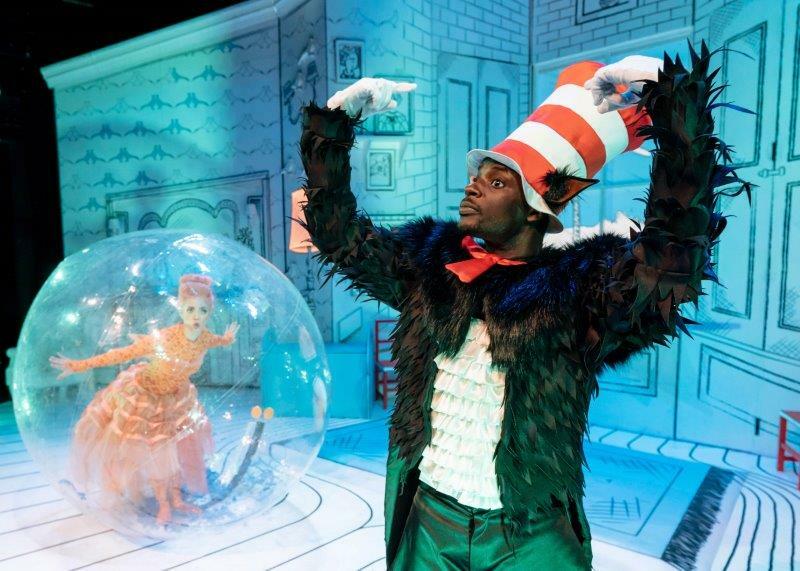 The Cat in the Hat fizzes and sparkles with energy, it’s brimming with an innocence brought to life by Amoo-Gottfried’s delightfully cheeky cat, but most of all, Lowe and Angell make the whole thing tremendous fun, even for those of us in the ‘older’ age groups.